Provocative contrasts and hair-raising stories in the cluttered centro histórico. The grid layout of the streets of the centro histórico remains practically unchanged since the times of the city’s origins in 1541. The area today is a clutch of office buildings, shops, banks and cafés that is dignified by a handful of beautiful churches and palaces squashed between buildings dating mostly from the 1930s and 1940s. Beautiful Paseo Huérfanos runs east-west offering a good assortment of the centro’s architectural styles and a better opportunity to contemplate life in the historic quarter. People here are divided between the diligent and the idle: as businessmen march up and down to and from the workplace, some can still afford the time to sit and read a newspaper in company of street musicians. Wandering around this place you’ll quickly notice how life on the centro histórico remains to a great extent ritualistic, old-fashioned and male-orientated. This distinct part of the centro is a bastion of octogenarian tailors and shirt-makers, of shoe-shiners that religiously serve customers at the doorsteps of banks and of cafés that are all but male-only establishments. The latter, for example, will be simply impossible to ignore, with their teams of lady baristas dressed in revealing outfits for the enjoyment of their macho clientele. Known locally as Cafés con piernas (literally ‘coffee with legs’), these cafés continue to be a unique, if eyebrow-raising tradition in the Chilean capital. Most Santiaguinos will tell you that they are just about coffee, and this is true for the more venerable Café Caribe and Café Haití, which otherwise serve exceptionally good brew. Others, however, have more dubious reputation but they seldom swing into illicitness. In any case, don’t expect bucket-sized frappucinos, soya-lattes, lounge-style seats, or even Ladies toilets. Espresso at the bar is the rule; cortado (macchiato) for a wintry day. As soon as you’re sated with profanity, jump straight into sacredness at the corner of Agustinas and Estado, where the Iglesia de San Agustín offers one of Central Santiago’s most mysterious locations. The churchgoers here are still a community in their own right. You can occasionally catch a glimpse of ladies dressed in traditional black dresses and embroidered veils attending the early morning mass, but even if this has become an increasingly rarer sighting, the number of fervent devotees to this church is still going strong. The temple was originally built by the Agustinians, a relatively late arrival among the Religious Orders that settled in Chile. They arrived in 1595 and were left with little choice of land to build their convents, as colonial regulations set out strict criteria relating to the location and orientation of religious complexes. By the turn of the 17th century, the Agustinians had built their first church, reportedly one of the most beautiful in the city, in fact so beautiful that, legend has it, was set ablaze only a few years later by resentful Franciscan monks in disguise. A second church was built on the site and later destroyed in the earthquake in 1647. The present day temple – dating from 1705 – was built to a baroque style and decoration. For much of the 19th century, however, the church was disused and served as an arsenal and military academy, being subject to a continual looting and a heavy deterioration. Only in 1863 the temple was recuperated under the direction of Fermín Vivaceta, who entirely remodelled the building’s façade, including the addition of two bell towers, the columns and the set of wooden doors, hand-carved by Vivaceta himself. The interior of the church has been recently refurbished in order to highlight its most precious piece of veneration, the Cristo de Mayo with its unmistakably painful and distressed appearance. This image dates from around the year 1600, and is linked to the popular myth of la Quintrala (See inset) as well as to a miraculous event on 13 May 1647. The earthquake that struck the city that night brought virtually every building to the ground, including – as already mentioned – the San Agustín. The crucifix, however, remained intact for the exception of its crown of thorns which had inexplicably slipped from his head to his neck even if the figure’s head was larger than the diameter of the crown. A bewildered bishop of Santiago, Fray Gaspar de Villaroel, found and rescued the image among the debris, and dragged it barefoot from the church to the Plaza de Armas, where it was greeted in a mix of hysteria and desolation by a gathering of survivors. A procession to commemorate the events of 1647 quickly evolved into the city’s most momentous religious festivity, and in the decades after the tragedy, every 13 May became a larger than life event, where pilgrims did not spare in acts of self-flagellation, so much, that historians have recorded that during the 18th century, the streets of Santiago would appear “drenched in blood the morning after”. The procession still takes place today every evening of 13 May, and although the following is still large, you’d be relieved to hear that devotees no longer indulge in the bloody practices of yesteryear. 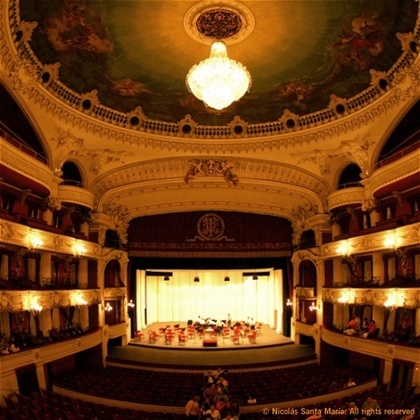 A different kind of overture: Santiago’s Teatro Municipal embraces change. 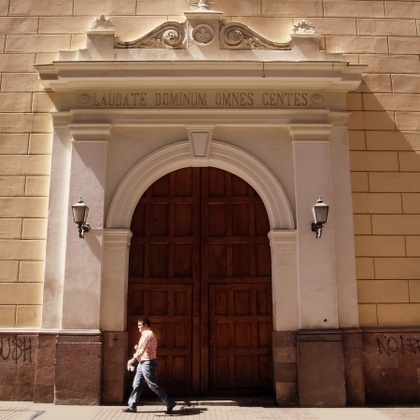 Follow Calle Agustinas to the Plazoleta Mekis to find the Teatro Municipal, the beautiful Opera house built in 1857, which despite its recent 150th anniversary has been marred by financial difficulties and industrial actions by its staff. (See section On Stage) But the effects of its woes haven’t been all that negative. This once select hangout for Santiago’s richest citizens has been forced to leave its elitist vocation behind. It is now opting for more innovative programmes, which have included contemporary dance, Opera performances at low cost and even a season on experimental electronic music. It also recently opened its ritzy tearoom with entrance from Calle Tenderini, where you can enjoy the superb pastries of Café Tavelli in the opulence of its saloons. Calle Tenderini leads you north to Calle Moneda, where you’ll be able to distinguish the back gardens of the massive Biblioteca y Archivo Nacional, at the corner with Calle MacIver. The National Library has a permanent collection of important material from all over Spanish America on display at the Biblioteca Americana José Toribio Media, plus a good number of seasonal exhibitions regularly held in its neo-classical reading rooms.